By studying for this Principles of Business and Administration qualification, students learn the key concepts and a range of administrative procedures required to work within a business. This course teaches a variety of different admin systems, incorporates the role of administration work within large and small corporations; whilst teaching what it takes to manage a successful team. This Level 3 Certificate in Principles of Business and Administration has been specifically developed to teach the knowledge required for students to work effectively, both as individuals and in teams within business. Being able to develop good business skills is crucial for any company and the skills we will learn can be used in many different industries and have a vast array of uses. Having a sound understanding of how businesses work and the markets in which they operate is valuable for any employee. Knowing the factors that influence a company and the roles within a business that must be carried out, will give you a better appreciation for the marketplace. This understanding will also help you understand the reasons for decisions that are made. In this unit we will look at business innovation and growth, budgeting and financials as well as sales and marketing. This will give you a great insight into all the different aspects of a business that come together to make a company profitable. Having a sound understanding of how to work in a business environment is valuable for progression. Knowing the documents and systems within a company and the roles within a business, will offer you a better understanding of presentation and negotiation. This understanding will also help you understand business communication models, systems and processes. 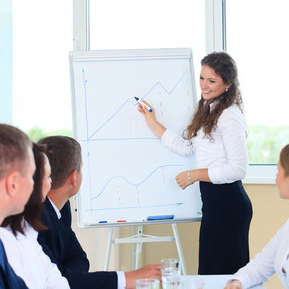 In this unit you will learn how to how to develop and deliver presentations in a professional manner. You will also learn how to aid negotiations by providing clear and accurate bespoke documents. In this unit we will cover the main principles of administration. Under this heading comes many different areas. You will learn about office management and organisation. You will also learn the principles of meetings, whether in attendance or chairing, along with how to manage and supervise an administration team. Another part of administration is organising business events. These take a lot of planning and skill. This unit will take you through all the components of an event and how to organise them. This unit will cover techniques that can be used to help a business improve. Sometimes techniques and processes need to change for improvement to happen. These changes can effect staff and their morale. Unit 4 will teach you how to effectively manage change with as little disruption as possible to personnel. The ability to make good decisions is highly sought after in the business world. Decision making is one of the key components of good management. Your ability to make decisions will directly affect your leadership style and skills. In this course you will learn how to make effective decisions and the different styles of leadership. Management is handled in a variety of ways. In this unit we will cover the role, functions and processes of management. This will directly related to helping your understanding of performance management.